Can I live in Germany without any health insurance? No, it's illegal to be without insurance! By law, you cannot live in Germany, even temporarily, without being covered by health insurance. If you are not insured, your visa request or university enrollment will be denied. But what if I have the EHIC? The European Health Insurance Card (EHIC) is issued by your national health insurance provider and is only valid during a temporary stay in Germany (as well as in any other EU & EEA country). If you're a EU resident, you should apply for your EHIC before traveling to Germany. You need to get information from your insurance provider in your country of origin for all terms & conditions. More info about the EHIC here. Important: If you decide to work in Germany, even for a short period, you must apply for a German health insurance! Can I move to Germany with an international health insurance? This could be quite risky, because most of the foreign insurance companies are not registered with the financial regulatory authority in Germany, or BaFin. Even international companies that are authorized in Germany often do not meet the requirements & standards decided upon in new reforms. Currently, almost none of the major international health insurers provide a German-language certificate recognized by the visa authorities in Germany, thus your visa or residence permit could be denied. April 2016 Update: The Ausländerbehörde (LABO) in Berlin is already denying most of the international health insurance plans. Do I automatically get insured when I start to work or study in Germany? No. In Germany, you do not automatically get an insurance card when you start working or studying. You must first register with a 'Krankenkasse' (German health insurance fund). As an employee or a student, you must inform your employer/university which health insurance company you have chosen. 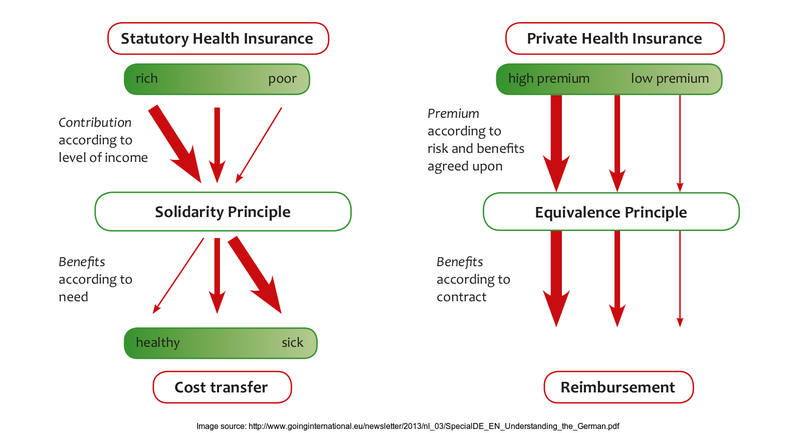 There are two different types of German health insurances: the public health insurance (GKV) and the private health insurance (PKV). While most people could be eligible for the public health insurance, being accepted by a private health insurance is more difficult and tricky (many conditions). I don't have a German address yet, can I apply for a German health insurance? It depends. If you don't have a German address yet, you'll not be able to become a member of a public health insurance company (e.g. Barmer, TK, AOK). By law, you need first to do the so-called 'Anmeldung' (German address registration). Once your German address is registered at the 'Bürgeramt' (local citizens office), you'll be able to apply for a proper German health insurance. More details in here. If you're applying for a German visa, you'll need to prove to the German authorities that you already have a recognized health insurance. In this case, you'll need to apply for a travel health insurance (scroll down to the 'Travel Health Insurance' category). The public health insurance is based on the principle of solidarity to ensure that everybody is able to access health care services. Which type of health insurance do Germans prefer? Germans trust their state health system: about 85% of the German population is insured under the GKV (national health system). Over 9.5 million people are insured with TK, which is one of the biggest statutory health insurance provider in Germany. Other popular health insurance providers are Barmer and AOK. Is the membership in a public health insurance compulsory or voluntary? Membership in the public insurance is usually mandatory for employees (gross income below the social security ceiling), pensioners (if registered with a statutory health insurance fund or covered by a family insurance plan for a certain length of time) and people receiving social welfare benefits. It is also possible to be insured on public insurance voluntarily. Usually those eligible are members of public insurance funds who were previously on compulsory public health insurance, but do not fall within this category anymore, e.g. employees earning more than 59,400€ per year (gross – 2018 data). What’s the main difference between ‘compulsory’ and ‘voluntary’ public health insurance? When it’s mandatory to join the public health insurance fund, your employer is required to pay roughly half of the contributions for health insurance and long-term care. When it’s on a voluntary basis, your employer is also required to pay roughly half of the contributions, but only for those services that match the public health insurance coverage. Ask your employer about details! The contributions for pension and unemployment insurance are not affected. The employer must always pay these to the health insurance fund. According to the German civil code (Sozialgesetzbuch), the employer also needs to pay half of the costs of each dependent family member. Important: When it’s on a voluntary basis, make sure you register with a statutory health insurance within 3 months; after that period, you'll have less chances of getting accepted! Pupils, language students, students enrolled in preparatory (language) courses for university, trainees (not for university purposes), scholarship holders & doctoral candidates are only entitled to take out private health insurance! The difference is mainly the price: once you go ‘voluntary’, you pay more! Who is eligible for the compulsory public insurance scheme? What are the advantages of choosing the public health insurance instead of the private one? Students with low or no income benefit from a fixed reduced rate. Contributions are based on your income and are deducted every month from your gross salary. Your employer roughly pays half of the amount that is decided by law. On top of this comes an additional premium that may vary depending on the health insurance fund. Everyone pays more or less the same percentage of income: the 2018 rate for TK is 15.5% but that rate can change each year. You will often benefit from a reduced contribution if your salary is between 450,01€ and 850€ (2016 data). Freelancers or self-employed people are usually not entitled to join the public health insurance. As a freelancer, you'll have to apply for a private health insurance (not that easy if you're new in Germany!). 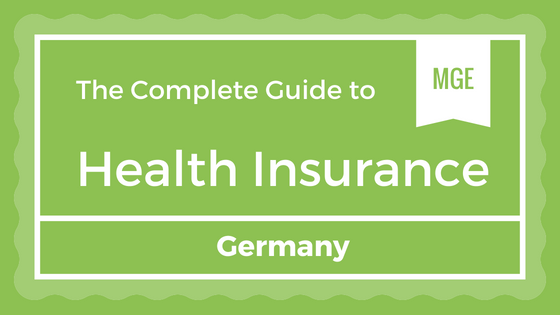 Read our “German Private Health Insurance” section further down for more details. Exceptions: You may qualify if you have had prior public health cover in Europe and apply within 3 months of arriving in Germany. If your visa allows you to work in Germany, you will be able to join the public system by taking up employment earning between 450€ and 4,687.50€ per month – or more, if it is your first employment in Germany (2016 data). Special case: There is a social security insurance scheme (KSK) for self-employed/freelance artists and writers (journalists, editors, writers, and so on)! By law, all students enrolled at German state universities, state colleges and universities of applied sciences as well as those who are completing practical training (as stipulated in the study regulations for a degree course) are subject to compulsory public health insurance. Without proof of health insurance, enrollment is not possible. As a foreign student in Germany, you must insure yourself with a statutory health insurance if you are under the age of 30 (until you reach your 30th birthday or until your 14th term of study). After that, you can still choose the public health insurance but on a voluntary basis. Important: Foreign students who are privately insured (for whatever reason) but have not yet reached the age of 30 will require a waiver from the public health insurance. Afterwards, taking out insurance with a statutory health insurance fund will no longer be possible! As an international student, can I be exempt from taking out a German health insurance? Depends. If you come from EU/EEA countries, are under the age of 30 (until you reach your 30th birthday or until the 14th semester) and are in possession of the EHIC, you can be exempt from taking out a health insurance in Germany, but you'll need to provide a proof of health insurance from your country of origin. You need to get information from your insurance provider in your country of origin for all terms & conditions. Please use your EHIC to register with a statutory health insurance fund in Germany (i.e. Barmer GEK). The insurance fund will then provide a confirmation for the enrollment at the university. Info about other social security agreements outside the EU here. Is the compulsory public health insurance convenient for a student? Yes, it's often cheaper than the private health insurance. The public health insurance is offered at an average reduced rate of 81,61€ per month. Rates can differ slightly if you're married or have children. The contributions are fixed by law, so all national health insurance providers have the same monthly rates. I'm 31 years old, can I choose the public health insurance on a voluntary basis? Yes, but... PhD students or students after the 30th birthday (or after the 14th semester) will have to pay an extra individual rate or, sometimes, may not be eligible at all to join a public health insurance. Pupils, language students, students enrolled in preparatory (language) courses for university, trainees (not for university purposes), scholarship holders & doctoral candidates are NOT entitled to take out public health insurance. Private health insurance is chosen by those who do not fall into the compulsory public insurance category, e.g. self-employed or freelancers, employees above a certain salary, and so on. Private health insurance is more complex because fees are based on your state of health, your age and on your insurance tariff, thus fees can change from one person to another. What is the main pro and con of private health insurance? Pro: Services could be individually adapted to your needs (i.e. there are treatments & drugs that are not available on the public insurance, but are covered by private insurances). Con: You'll first have to pay some treatment costs yourself and the insurance company will then reimburse your costs at a later stage upon submission of the bill. This is often not the case for small bills which could be paid out of the pocket. Concerning big expenses (i.e. operations), you should always ask clearance to your insurer beforehand. Private health insurance contributions are based on your risk profile (i.e. your state of health, your age). The older you are, the less attractive you are for a private insurance. Recommendation: Advice from an independent insurance broker is recommended for this category. Who would be eligible for private health insurance? Private health insurance fees can vary from one person to another. This can be surprisingly difficult to grasp if you're a freelancer and relatively new in Germany. Taking on a new client is a lifelong commitment for the insurance company – which is not allowed to throw out clients because of high claims or non-payment of their monthly premiums. So insurers are likely to require confirmation of your income. Many companies often require a minimum period of two years visa to be suitable for the private insurance. It gets easier when you have a German credit history of two or three years; so your situation could be easier if you decide to stay in Germany for a long term. The best thing to do is to already search for a solution before entering Germany! If you are employed in Germany and earn more than 59,400€ per year (gross - data 2018), you can choose to leave the public health insurance and get a private health insurance. Your employer will contribute roughly half of its cost. If you are young, healthy and earn a high salary, private health insurance may be cheaper than the public option. Important: Should you switch to private it is very hard to go back to public. In certain situations it is even impossible! Private health insurance is only allowed in exceptional cases. Reminder: Pupils, language students, students enrolled in preparatory (language) courses for university, trainees (not for university purposes), scholarship holders & doctoral candidates are only entitled to take out private health insurance! German Travel health insurances are also private insurances, but they are specifically designed for foreigners coming to Germany (incl. Schengen area) on a time-limited stay from 1 up to 5 years and returning home afterwards. Depending on the insurance provider you choose, this insurance could be the perfect solution for getting your visa or residence permit easily accepted, especially if you choose a German insurance company that is well known by the visa authorities. Important: This insurance is meant for short-term stays of up to 5 years (sometimes more) with the aim of you leaving the country afterwards. If your travel insurance contract expires and you decide to stay longer, it could be very difficult and much more expensive to get a new health coverage in Germany. Who can take out a German travel health insurance? Foreign citizens with no income (Remember: it's illegal to stay in Germany without any health insurance). Important: Foreign students participating in language courses in Germany as well as grant holders or graduate students at German universities cannot join the public health insurance scheme (e.g. Barmer, TK, AOK). In these cases you'll need to look for a cheap private health insurance for students. Note: If you are in possession of the European Health Insurance Card (EHIC) or any other Insurance Card accepted in Germany (see here), you can be exempt from taking out a health insurance in Germany, but you'll need to provide a proof of health insurance from your country of origin. You need to get information from your insurance provider in your country of origin for all terms & conditions. Can I use this health insurance above for visa application or residence permit renewal? Yes. this health insurance above meets all requirements for visa application or residence permit extension. After your online application, you will receive by email any necessary documents within a few minutes. These documents can be printed and immediately used for your visa application at the foreign embassy or for any permit extension at the various immigration offices in Germany. No matter whether you are staying abroad for a long term or only for a short break - do not forget that health insurance is compulsory for the whole population in Germany. This kind of insurances could be very risky as they often do not meet German standards. Some of these non-German insurance companies have been recognized by the German financial regulator (BaFin) as meeting the requirements for residents in Germany, but they usually do not provide documents in German, which would be necessary for passing the 'visa authorities test'. Moreover, this recognition is currently being challenged by German private health insurance companies so it might not be an accepted solution for much longer. Finally, the visa office also imposes additional requirements. April 2016 Update: The Ausländerbehörde (LABO) in Berlin is denying most of the international health insurance plans (e.g. MAWISTA or CARE CONCEPT). Make sure to ask your insurance broker about this situation! Supplemental insurances are useful to complement the health insurance system which is not complete. You can apply for it on top of your public health insurance no matter of your income, e.g. dental, vision, travel or alternative practitioner insurances. If you are privately insured, you cannot take out a supplemental insurance! You'll need to talk to your private insurer and extend your existing tariff to include additional services. Any type of insurance policy that protects you as an individual from the risk that you may be held legally liable for something such as malpractice, injury or negligence. Liability insurance policies (Haftpflichtversicherung) cover both legal costs and any legal payouts for which you would be responsible if found legally liable. Over 70% of German adults have a liability insurance. Third-party claim: someone sues you but you didn't do anything wrong! It is an insurance policy that combines various personal insurance protections, which can include losses occurring in your home, its contents or loss of other personal possessions in your home. This type of insurance will cover the costs for disputes with your neighbor or your landlord (i.e. paying a lawyer to protect you). The information provided in this article is not intended to provide or be a substitute for specific individualized insurance advice. Where specific advice is necessary or appropriate, myGermanExpert recommends consultation with an independent insurance adviser.